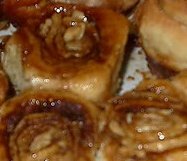 Sticky Cinnamon Buns Recipe by: Chef John V., A Good Cooking Recipe! To make the dough, combine flour, sugar, yeast, cinnamon and salt in the mixers bowl. Heat water, butter and vegetable shortening until it reaches 125 degrees F. Slowly pour this mixture into the eggs and whisk until combines. Add to the dry ingredients in the mixing bowl and mix with a dough hook attachment. You may need additional flour depending on the humidity. Mix 8 minutes on low speed. Place in a greased bowl, cover with plastic wrap and let double in size---about 45 minutes depending on the rooms temperature. Whip the topping ingredients until creamy, spray 2---9x13 inch baking pans with pan coating, then spread the whipped mixture on the pans bottoms, glass produces a better product and generally won't stick. Punch down the dough and roll into a 1/8 inch rectangle, spread with the prepared filling and roll the rectangle up lengthwise. Cut 1 inch rolls with a sharp knife and place them almost touching, (4x6 or 24 per pan) into the pans with topping. Cover the pans with plastic wrap and let proof until almost double in size. Bake at 350 for 30 minutes, or until the caramel is clear and rolls are golden. Remove from pan immediately and invert on serving or display tray.